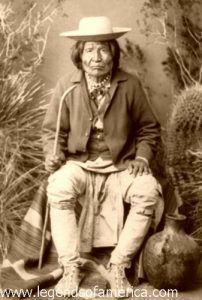 Known among the Mimbreno Apache as Kas-tziden, War Leader, Nana was born in 1800. He grew up to marry Geronimo’s sister and fought alongside Mangas Coloradas until Mangas was killed in 1863. During the Apache Indian Wars he raided areas of Texas and Mexico with Victorio. Though Nana had been with Chief Victorio when he was killed in the fall of 1880 at Tres Castillos, Mexico, he and several others were scouting for supplies and ammunition at the time, evading the ambush. After coming upon the dead warriors, Nana and his followers fled for the Sierra Madre Mountains of Mexico and soon devised a revenge campaign. Though lame in the left foot, suffering from rheumatism, and his eyesight failing, Nana was obviously still strong and in January, 1881, he and his men crossed the border back into the United States. Though his group never numbered more than 40 warriors, and was often as few as 15, they sought their revenge by raiding Army supply trains and isolated settlers. During those first few months, the band raided numerous small camps in southern New Mexico, killing two miners near Chloride and wounding another; killing four men on the Silver City-Mesilla Road, and in June, raiding and burning a ranch property near Lake Valley in 1881. Soon, a combined posse of civilians and Buffalo Soldiers pursued them into a canyon about ten miles west of Lake Valley. Unfortunately, for the posse, Nana and his warriors ambushed them immediately killing their leaders and wounding a number of others. A full-out gun battle followed that lasted six hours in which at least four more soldiers were killed. Others who were wounded would later die as well. Two months later, he and his band traveled to Arizona, where they were involved in the Battle of Cibecue on August 30, 1881. The U.S. Cavalry never caught Nana and his men, but fought them in at least seven engagements. Finally, when the band once more fled to Mexico, the U.S. Army gave up for a time, hoping the Mexicans would take care of the problem, as they had done with Victorio. Nana soon joined forces with Geronimo and continued fighting for two more years until he was captured in a surprise attack by General George Crook in 1883 and was sent to the San Carlos Indian Reservation in Arizona. He later escaped with Geronimo and fought with him during his last days of resistance. In 1886, both warriors once again were forced to surrender to General George Crook, and taking no chances with them, they and their warriors were sent to a prison in Fort Marion, Florida. In 1894, he was allowed to return west, not to his homeland, but to Fort Sill, Oklahoma. He died and was buried there two years later on May 19, 1896. He was 96 years old. 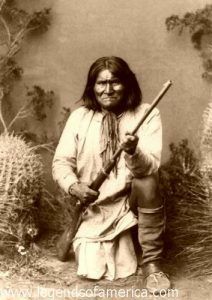 He had the longest fighting career of any of the Apache warriors. One of the great Chiefs of the Apache. Yet there are very few mentions of Lozen a great warrior and medicine woman who deserves honorable mention alongside the others.